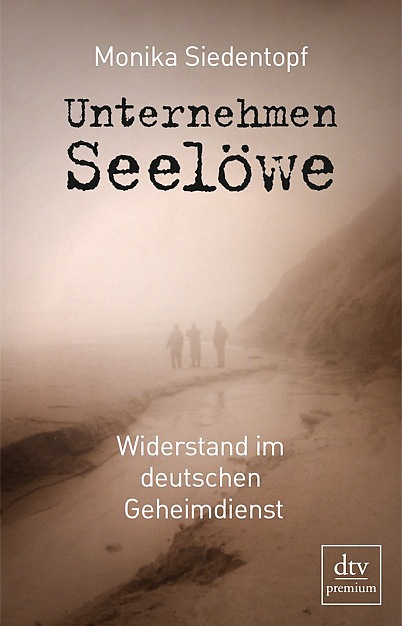 Unternehmen Seelöwe: Widerstand im deutschen Geheimdienst [Operation Sealion: Resistance in the German Intelligence Service]. Monika Siedentopf. Deutscher Taschenbuch Verlag, München, 2014. In the last year I have read several English-language books which have suggested that during World War 2, the German Intelligence Service (Abwehr), far from being stupid and incompetent, actively undermined the Nazi regime. Most of these books have focused on the role of Admiral Wilhelm Canaris, the head of the Abwehr, and his colleagues. A few months ago, I came across reviews for a new book which focused on the Abwehr's role in sabotaging Operation Sealion, Hitler's planned invasion of England in 1940/1941. This book, by German historian Monika Siedentopf, stretched my German language skills to the limit but was quite readable once I added some espionage and military terms to my German vocabulary. Siedentopf lays out the events leading up to Operation Sealion and gives a brief history of the Abwehr, MI5 and MI6. She then gives a brief overview of the various Operation LENA spies that were sent to England in 1940 and 1941, including Josef Jakobs. In the following chapter, she outlines the main players in the Abwehr and their connection with the resistance movement. Next, she zooms in on the Hamburg Abwehrstelle and outlines the main officers and their connection with the resistance movement. Finally, she brings it all together in a chapter devoted to Operation LENA and points how that the poor selection and training of the LENA spies was part of a larger plot to sabotage Hitler's plans to invade England. I had hoped that this book would have brought forth some German sources of information but Siedentopf draws heavily on the MI5 interrogation files at the National Archives in Kew. The information contained within those files is often sparse, weeded and incomplete. Siedentopf herself notes that Wichmann and the other Abwehr officers never really talked about their connection with the German resistance after the war, so some of her conclusions are based on inference. Given all that I have read, however, I would agree with her overall conclusion. The German Abwehr, so efficient in their operations against France, the Low Countries and Russia, was uncharacteristically clumsy against England. Some MI5 officers, such as Hugh Trevor-Roper, accepted such clumsiness as par-for-the-course with the Abwehr. But other MI5 officers (Guy Liddell) and English military officers (Kenneth Strong) were very perplexed by the poor training of the LENA spies. When one understands that the LENA spies were never meant to succeed, the pieces of the puzzle fit together quite neatly. At the highest levels, the German Abwehr sabotaged Operation Sealion, convinced that a German invasion of England would be a monumental failure and a disaster for Germany. The Abwehr officers had many difficult decisions to make but in the end decided that it was better to sacrifice a few hapless spies than risk the lives of thousands of German soldiers. I kept expecting a huge revelation from this book, a smoking gun, but it never came. I did appreciate how the author zoomed in to take a detailed look at Abwehr resistance activities in regards to Operation Sealion. Several of the chapters read like a who's who of the German Abwehr, with mini-biography following mini-biography. Towards the end of the book, the author notes that after the war, the Abwehr officers never talked about their resistance activities. Yet she makes very little reference to Nikolaus Ritter's memoir written in the 1970s. I was left rather disappointed at the end of the book - perhaps because I expected more German sources from a German author.